Kathy Adragna from Michigan asks: My 5 year old parakeet died two days ago. The vet said he died of liver disease probably due to his diet. I have a second keet same age male who I'm afraid will die too if I don't change his diet. Both birds were on a fortified seed mixture their whole life. In addition to the seed, they ate millet and egg busciut. Gravel in their cage. That's all. Tried numerous times to introduce fresh fruits & veggies. I recently purchased the Twin Beaks® Aviary's Herb Salad™, along with samples of pellets and nutra berries i received from the vet. It's been three days now and by keet don't want anything to do with the new food. I've tried mixing with his old seed mixture, and by itself. He won't even go near it. I'm afraid if I keep trying the new food, he'll starve. Can he starve to death even with food available? He won't let me handle him, so I can't hand feed anything to him. Otherwise appears very healthy. Will he eventually give in on his own. Should I take away completely the old seed mixture and offer only the new? Johnny Repko from Celina, Ohio asks: I am currently using the core supplements from Dr. Marshalls progam and have a question concerning egg food recipies. I am interested in making up egg food in bulk and freezing it and using it as needed. My question is, do I use the turbobooster and e-power in the egg food recipie or do I use another supplement of choice. And if I can use another supplement in my egg food recipie, what would you recommend? Many Thanks. Hello Johnny, You can definitely use the TurboBooster and ePowder in your eggfood receipe, but I would not mix it into the egg before you freeze it, but rather right before you feed it to the birds. Johnny Repko from Celina, Ohio asks: I have just received my starter pac and was wondering if when preparing the seed with the TurboBooster if I could prepare enough seed for a week and keep it stored in the refigerator instead of preparing the mixture daily. barb onnen from south dakota asks: Dear Dr Rob, I have two pair of gouldians, one pair on eggs and another looking interested in starting a family. I would like to start my birds on your system. Is it ok to start them now? I wanted to make sure any chicks produced get off to good start. Thank you. Christie Webb from California asks: Dear Dr Rob, I have been feeding a pelleted diet to my cockatiels and Indian Ringneck for a few years now. 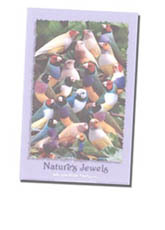 Are there any pelleted diets out there that meet the nutrition requirements for Lady Gouldians? I have asked this of a few of the companies out there, but would like an unbiased answer. Thank you! Shazia from Pakistan asks: Dr. Rob, I have a 5 months old indian ring neck.i don't know from where she reached the bucket of onions she ate them.since then she's not feeling well.she vomited a couple of days back,she's become fluffy,she is sleepy all the day,her breast bone is prominent due to weight loss.plz help me as i can't make an access to a vet becoz there aren't experienced vets in our area.thanks. ROCCO CICIRELLO from STATEN ISLAND NEW YORK asks: My canary has been on a pellet diet for months. 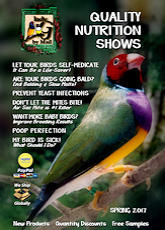 I was told by a very reputable canary breeder [LINDA HOGAN] that all she feeds her birds is vitamin fortified seed diet called L'AVIAN PLUS CANARY FOOD. He's been on this now for about 3 weeks, and he loves it. He looks better his feathers are tighter, and he's singing nice. I give these seeds, a little Petamine and some greens or fruit. Do you agree with this diet. Thank you. ROCCO CICIRELLO from STATEN ISLAND NEW YORK asks: Hello Dr. Rob. 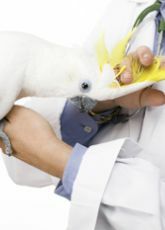 Is there a such thing as an iodine deficiency in canaries? because the pellets and seed bags say nothing about iodine in them. what do you recommend? Hello Karen, DufoPlus is a sugar and glucose free, water soluble vitamin that is preserved in nitrogen and Ioford is a sugar free mineral supplement. They are part of my routine Health Program. It is good to use sugar free supplements because there is less likelihood of bacterial growth in the drinking water. The NV Powder is an electrolyte/glucose, vitamin/mineral supplement that would be used for stressed birds, or sick birds until you could assess what may be wrong and then treat with the appropriate medication. Soaked seed can be a very important part of the breeding program for all birds. 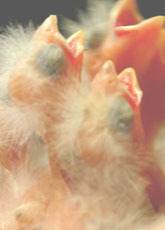 Feeding sprouted seeds to parent birds provides their babies with an instant source of energy. However, there are real potential dangers associated with soaked or sprouted seed as a source of energy and strict soaking protocols must be followed. I would not hold soaked or sprouted seeds over, but prepare a fresh batch for each day. Hello Charity, I highly recommend that you stop using the Soy. That is way too much soy and it as well may be toxic at those levels. Some reports say that it can also cause infertility.